Circumstance really is the mother of DIY Renovations (DIY RENOS). We are the LAST people to EVER even consider a DIY project of any magnitude, but our circumstances are as follows: wanting to retire someday, still paying college debt, the crummy economy, and a VERY outdated and downright worn-out, sad kitchen that we’d lived with for over 20 years. Something had to give. Enter the aforementioned Apartment Therapy January Cure apartmenttherapy.com. 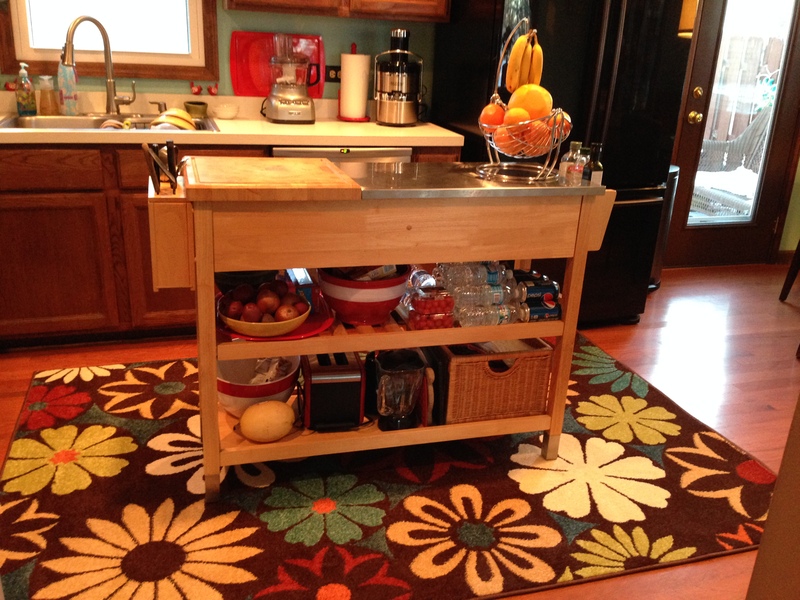 It seemed the more I organized our home, the more the problems of it were magnified. To be honest, every inner door needs replacing, all the knobs are outdated, ugly and can be opened by a cat or dog. But, worse of all was our kitchen. 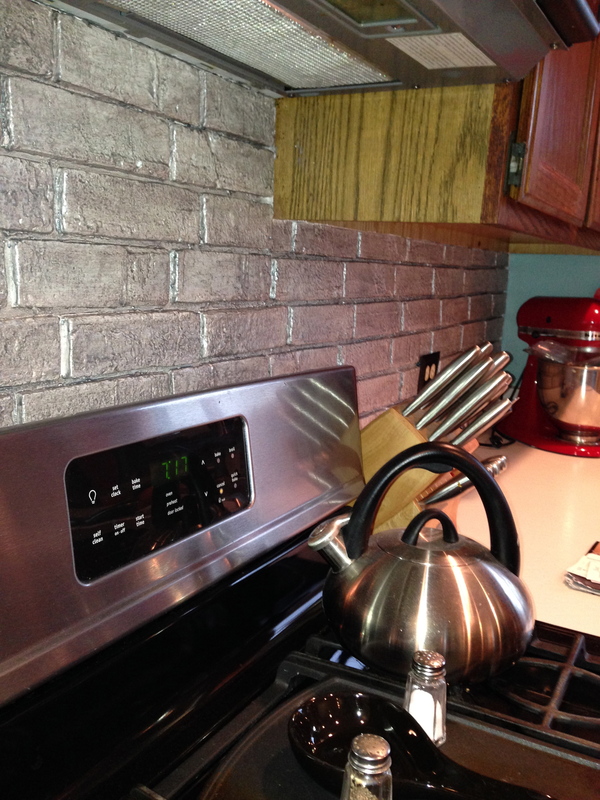 We simply thought in order to redo our kitchen we’d need a 20 thousand dollar budget. Plus,we’d just replaced all our windows, and two years ago installed hardwood flooring, and we all know it’s not the product, it’s the installation that costs so much. Twenty grand was not in the cards or bank account. Rick was totally reluctant about considering anything DIY, “Leave me out of your psychosis” is his favorite saying. But, suddenly, the things that really needed to be updated began to niggle at him, too. We had one door that had begun to peel at the bottom, like, 10 years ago. Rick decided to tackle the door. After HOURS, I kid you not, spent together in the aisles of Lowes he got all the “stuff” and was able with some complications, and directions from my newly found expertise from watching The Property Brothers, to get the door hung, and it was darn successful. Ahhh, let’s conquer the DIY world! 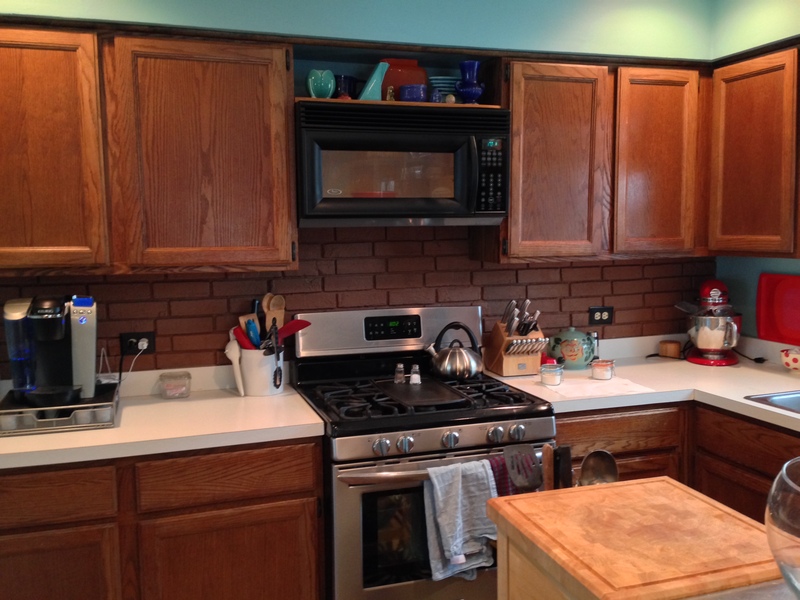 Let’s redo our kitchen! Boooyah! Here was the deal, we had budgeted one thousand dollars for the project and three weekends with one of them being a four day weekend to complete the cabinets. Doable. I decided instead of trying to make it go away, we’d make it a design element in our kitchen. I was thinking pearlescent. We found pearl paint with pearlized glaze at Sherwin Williams sherwinwilliams.com. Went home and applied two coats of the primer and let them dry, it was pink, hmm, my least favorite color. Rick says maybe the glaze will soften that? 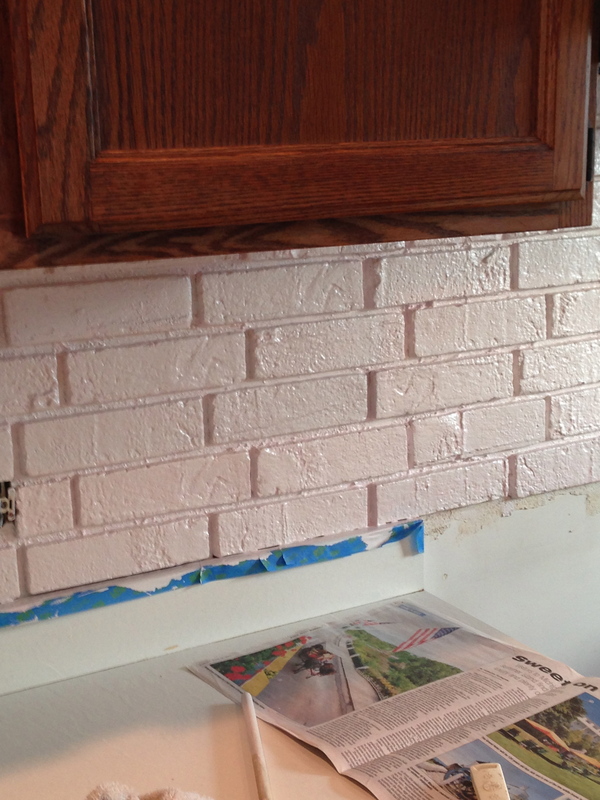 Glaze the entire back splash, now it’s shiny pearlescent pink. I hated it. Back to Sherwin Williams, bought a silver metallic glaze to put over the pink pearlized glaze, and Voila, design element #1 achieved, and it’s amazing. Design Element #1 complete and beautiful. We savored that accomplishment for a few days, and then decided we’d tackle the countertops on week two (so much for Rick’s mantra). < Brinkley, my friend, till we meet again.